I suppose there are lots of problems you can have in the kitchen, but is having too much braised pork one of them? I suppose it could be, but in this case, I’m going to say no. The truth is even after listing all the ways to use the pork in my last post, I felt like something was missing and I needed to find a new way to use my leftovers. Make no mistake, I love tacos and barbecue pork sliders as much as the next person, but this is a chance for me to learn and share new recipes as well. So, there I am with a tupperware container full of beautifully braised pork and not a clue what to do with it all. I opened the fridge for inspiration and all I saw was chicken broth, cilantro, some tortillas, chili, a little bit of rice, and a few other things. Okay, there is more in my fridge but I needed a setup to share this recipe. So, I closed the fridge and kept saying to myself the only thing in here is soup. It is fall, so maybe that wasn’t such a bad thing after all. What to make I wondered to myself. It was right there on the tip of tongue for a few minutes when I realized exactly what I should make. More soup, of course! Not just any soup though, but tortilla soup! 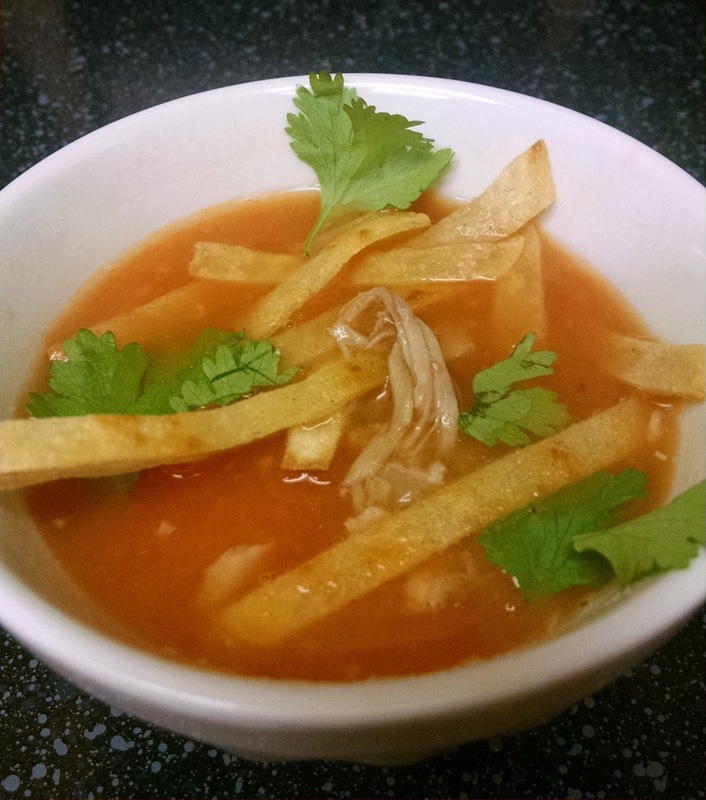 I had often wondered about tortilla soup as it has such an incredible depth of flavor and was highlighted with that punch of citrus. I quickly realized that I had a great counterpoint to the rich braised pork with that kind of a soup base. When I think about soups like this, I think of broths that simmer for days and days to achieve that perfect balance of flavor. While this can be true, I like the idea of being able to put the dish on the table the same day. Did you know that you can put this recipe on your table in about an hour?? The other thing is that I like pantry friendly recipes. In other words, you likely have the ingredients in your house to make this already. So, I set out to find a recipe that worked. Here is the base recipe we are using, however, I have made changes. I know, what a shock! Before we talk about mastering this recipe, I wanted to show you what you could be consuming. Ready? This is absolutely as good as it looks and more!! I am wondering what I should have for lunch? Hmmm……………but I digress. Okay, recipe time! Heat 1 tbsp. olive oil in a large soup pot over medium heat. Add onions, a pinch of salt, fresh ground pepper, and cook about 5 to 7 minutes until softened. 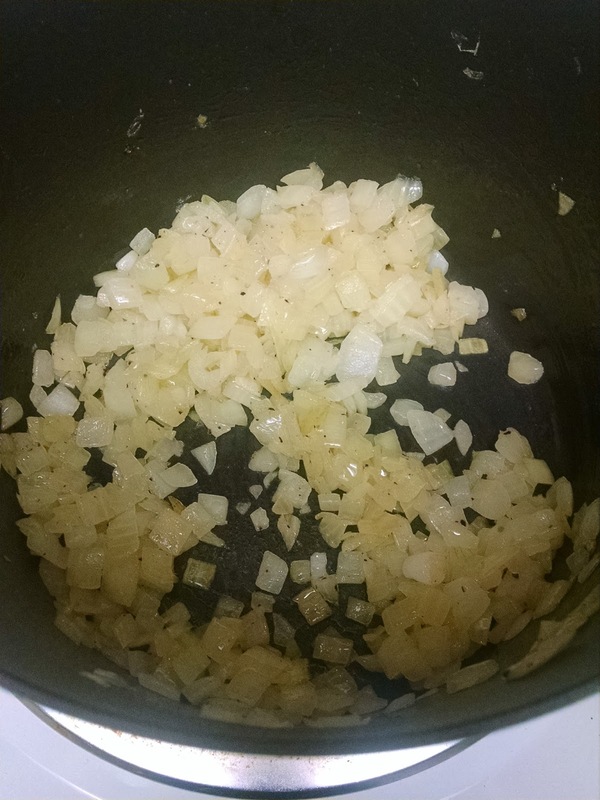 Stir in two-thirds of the garlic, a pinch of salt, cumin, chile flake/chili powder, and cook 2 minutes. 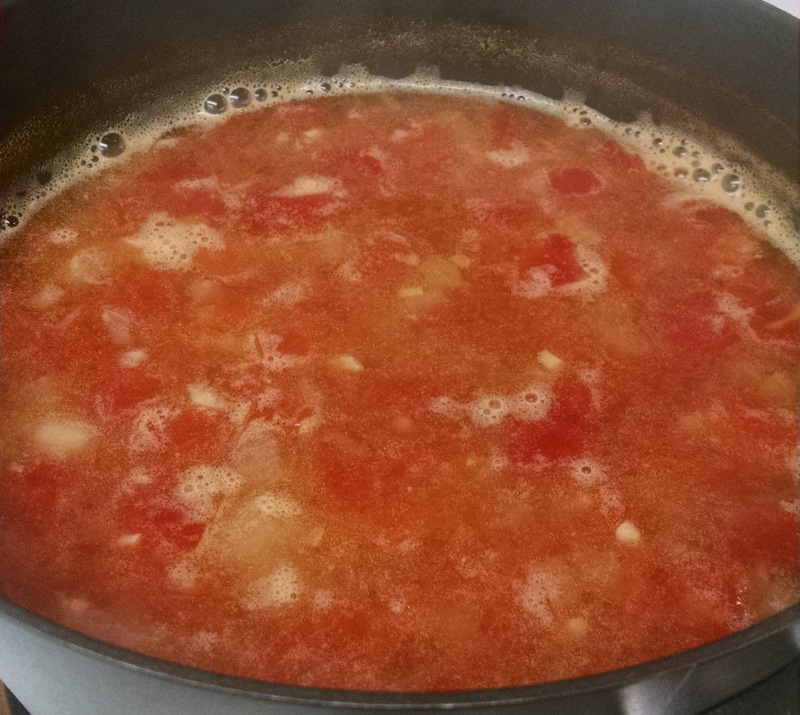 Add broth, tomatoes, and half the lime juice and turn up heat to a gentle simmer and cook about 25 minutes. 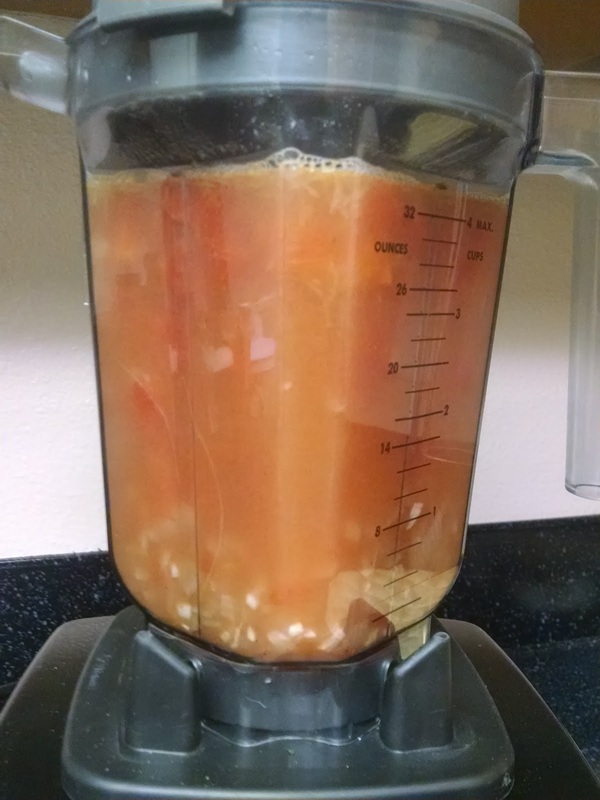 Purée soup in batches in a blender or food processor. Return soup to pot and resume simmering. 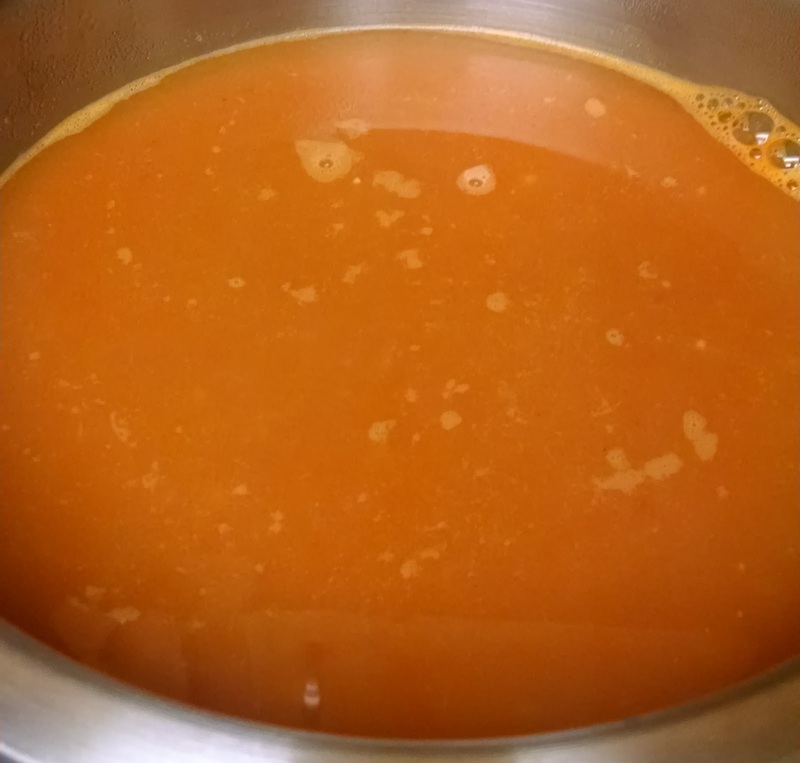 Here is a bonus photo of what the broth should look like when it is all done. In a small bowl, toss chicken or pork with remaining lime juice, garlic (optional), and a pinch of salt, if desired. 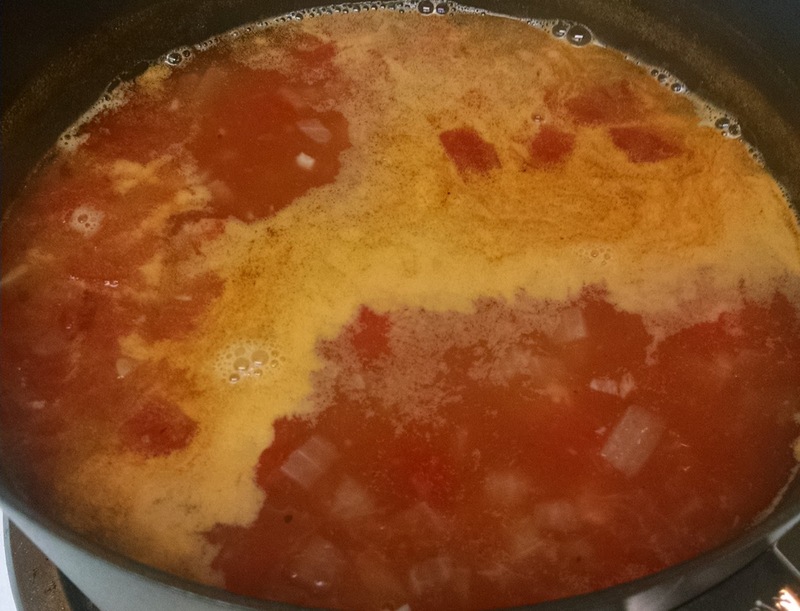 Marinate at room temperature for 10 minutes, then add to soup and simmer 5 minutes, until chicken or pork is just cooked through. While your soup finishes simmering and before are ready to serve, add 2 tbsps of olive oil into a small frying pan set over medium-high heat. When oil is hot but not smoking, add one-third of the tortilla strips and cook until golden brown and crisp, about 2 minutes. With a slotted spoon, transfer strips to a paper towel-lined baking pan. Repeat with remaining tortilla strips in two batches. Sprinkle with a pinch of salt while hot. Top with tortilla strips, additional toppings, and fresh cilantro. There it is! Boom! This is so good! Servings for centuries- When I test recipes I am only testing for a couple of people. Even cutting this recipe in half I had a lot of leftovers. That isn’t a problem, but keep that in mind unless you plan on freezing some or giving away some amazing tortilla soup. By the way, it is almost the holiday season and this could make a great gift! I’m just saying. Salt- If you read the reviews and look at the recipe, there is a lot of salt here!! In fact, there is way to much salt in the original recipe from my vantage point as I type this. Here is my take on this issue. You are always better to under season than over season since you can fix that, but going the other way is much more difficult. We add salt to help enhance other flavors and it helps to wake up the palate so we can taste other things better. As you cook, season each layer with a little salt. Also, you are adding more salt right at the end before you serve this to really give some complexity to the the lime juice. So, it is totally okay to ease up on the salt if you are concerned. Cumin and Chile Flake/Chili Powder- As I discussed in my chili post, these flavors can pack a punch and can easily overpower a dish. You can always add more, but again, less is more. This is especially true if you have someone who is sensitive to those flavors for whatever reason. Cilantro- Maybe this goes with saying, but sorry, I can’t stop myself from talking about it. There are two cilantro camps, either you love it or you hate it. There isn’t much love in between. You could certainly leave it out and go with something like parsley, celery tops or even some basil. But, you don’t need the cilantro to sell this soup because this soup will sell itself. Topping takeover- This recipe lists all kinds of topping options and they will compliment the soup perfectly. I opted to keep it super simple with just cilantro and the tortilla strips. For me, that was all the soup needed. You worked hard to make this soup, so make sure you have a chance to enjoy the fruits of your labor without getting lost in the toppings. Gravity of Garlic- This recipe does call for fresh, raw garlic to be used to marinate your choice of protein before it is added to the soup. As much as it provides some additional flavor, I’m not sold that you need the garlic. It could be overpowering and super sharp when you take a bite of the soup. Just be careful if you decide to use the fresh garlic in that application. Also, cuddling and breathing on or near your significant other could be compromised by heavy garlic consumption. Unless your significant other has consumed garlic as well, then party on! Hey, I’m just trying to look out for my readers. Ready to make this for meatless Monday?? Yup, you are practically there and you didn’t even realize it I bet. Just replace the chicken or pork for things like roasted corn that you have taken off the cob, roasted bell peppers, zucchini or some sweet potatoes that have been grilled or sauteed. This is will make for an an amazing lunch or dinner anytime! I hope you enjoy this simply delicious, but complex soup. This is perfect for the fall months and it just looks pretty! As always, be sure to leave a comment or email me and let me know your thoughts about this recipe. I look forward to hearing from you!